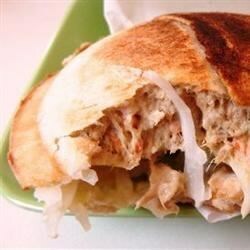 "Quick and easy baked tuna pocket sandwiches -- so yummy! Even delicious the next next day." Lightly stir together the tuna, onion, celery, shredded Cheddar cheese, dill, and mayonnaise until well combined. Flatten the biscuit dough to about 1/4-inch thick, and place the 8 flattened biscuits on an ungreased baking sheet. Place about 3 tablespoons of the tuna mixture on top of each biscuit, and top each with another flattened biscuit. Pinch the edges to seal in the filling. Bake in the preheated oven until the filling is hot and the pockets are lightly browned, about 15 minutes. Refrigerate leftovers. Vary the pockets by using canned chicken and your favorite cheese. My grandmother used to make these, but we always used sour cream instead of mayonnaise, and I use Mrs. Dash instead of dill weed. Excellent substitutions if you want to try them. Really simple! I used sweet relish in my husband's and he loved them. You can also add boiled eggs. They didnt take hardly anytime to make and they are really great for bagged lunches! These were quick and easy to make. I wish I could have got more filling inside, but I was weary of tuna explosions. A good basic recipe.